I recently went to a seminar on food sustainability and security and these seminars never cease to provide me new angles, perspectives on the status of our food and ideas for blog posts! So, thank you dietetic seminars! Okay, so today, I’m hear to not convince you to take the Supplemental Nutrition Assistance Program (SNAP) Challenge, but to help you become more open to the idea of becoming more aware of how much you’re spending on food and perhaps start questioning if you really need to be spending as much as you can. The SNAP challenge is intended to help provide better insight into how many low income Americans live on a daily basis. 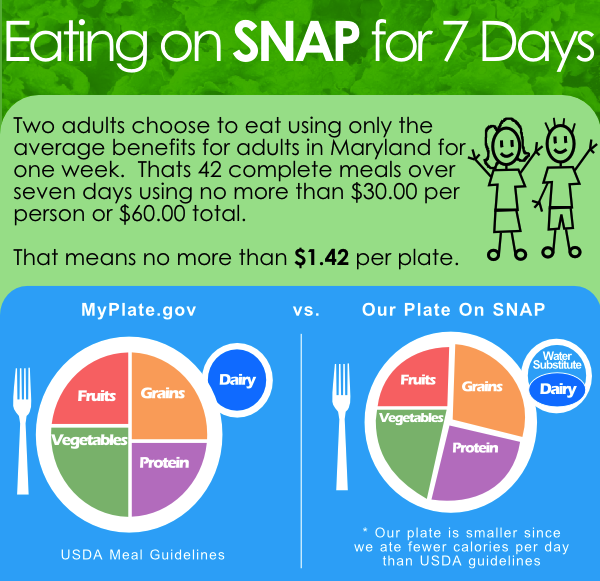 By accepting the SNAP Challenge, you are committed to consuming all of your meals and beverages for one week at a similar budget of a SNAP recipient–$1.50 per meal. While tempting, try your best to avoid free food from friends, coworkers and family members. How did your shopping cart look compared to a normal week? What choices did you have to make about the types of food you could afford, where you shopped, or the nutritional quality and variety of food? What have you cut out of your routine to stay on budget (e.g. COFFEE)? How would this experience be different if your spouse and children were also eating off a limited food budget for the week? How has eating on a limited budget impacted your mood? Your concentration? How has that impacted your interaction with family and coworkers? Are you worried about your groceries running out before the end of the Challenge? Do you feel you are you eating a healthy, balanced diet? What nutrition decisions did you have to make? We know that low-income Americans have to make choices between groceries, prescriptions, gas for the car, utilities, and other household necessities. After living on a limited food budget this week, how has your perspective changed about the decisions families facing hunger must make? In November 2013, the government will cut SNAP benefits for all recipients. These cuts will be $36 for a family of four – dropping the average benefit per person per meal to under $1.40. How would this week have been different for you if you had even less money to spend on food? I understand each family is different, with different needs and preferences, yet this challenge can be done by any one and every one. I hope you’ll keep this challenge in the back of your mind when next time you’re planning family meals or trying to find ways to creative ways to cut your budget. Good luck!